A Gnome Accessory (how to make a miniature felt lantern). Following on from the last post I have been asked how to make the gnome’s lantern. It is a very simple, fun project, using very little in the way of materials. Here is my version which I am delighted to share. The lantern came about through sheer accident, as often is the way. Scraps lying on the table led to an “aha! “moment when contemplating that a gnome I had made needed something other. I am not giving exact sizes but rather a method to create small, felt lanterns to your own specification. The layout picture shows you all the pieces and how they fit together. As the pieces in this instance were very tiny the picture above should be self explanatory but I shall also “talk through” the process . 1. The first part is the lantern case holding the light. For this a tiny rectangular piece of yellow felt was used, rolled up along the longest edge and then stitched together down the short side. I used a whip or overcast stitch, but you could also use blanket stitch .My rectangle measured 2” (5cm) by 3/4in (2cm). 2. Next find some tiny scraps of dark brown or charcoal coloured felt. From this cut two narrow strips to fit around the top and bottom of the lantern and two more thin strips that fit the length of the lantern. I stitched these onto to the cylinder. You can omit the two felt bar strips and just use thread such as crochet or perle cotton or several strands of embroidery floss to make the bars. 3. Using the cylinder make a base template by tracing around it. You will have a little circle that is the base. Cut this out as a template and place on the dark felt. Cut out and then stitch the circle onto the bottom of your lantern . I used blanket stitch around the base – it gives an nice finish . 4. Now make a slightly larger circle than the one you used for the base; think gnomes cap. Cut this out of the dark felt. 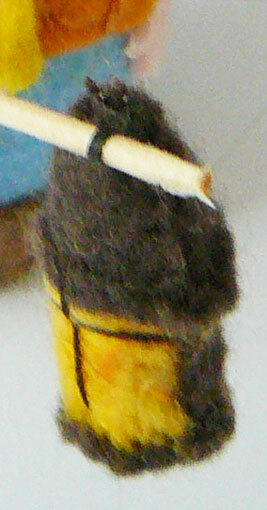 Take a little pie slice out of the felt circle and stitch the opening of the dart closed. It will make a tiny domed lid. Another way to make the top is to use a semi circular shaped piece, Pop this onto the top of the lantern and secure. I attached my lantern to a toothpick after cutting off the sharp tips. You can attach it to a hand as is , or sew on a tiny jewelry ring. 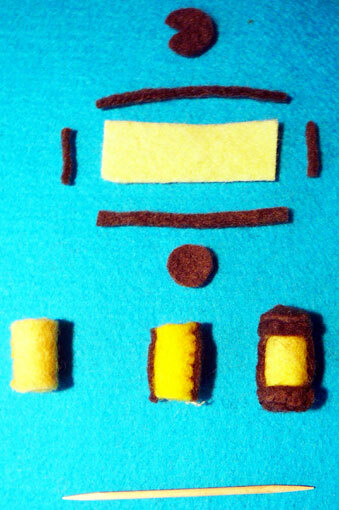 To make a larger version instead of rolling the yellow felt into a solid cylinder joint the sides and stuff . You can scale up or down, try a square lantern , cross hatch the glass, and………Allow you imagination to play. This is adorable! This is the first time I have come across your blog, and I must say your felt art is amazing! I have never seen such awesome felt faces on creations like yours, very beautiful! Thank you .Pleased to hear that you have stopped by and enjoyed. Oh, I really need to make one of these for all the gnomies on our nature table.